What are the taxes levied in France, and what are my responsibilities in this area? It's a taxing question, but one which must be asked, and answered, by anyone who lives, or hopes to live in France. (Life in France.) How does the French taxation system work? How must I make my declarations, pay my French taxes and when? Who is actually tax liable in France, and who is liable for the dreaded French wealth tax? What, when it's at home, is TVA? The information supplied below is intended to give a brief and hopefully reasonably accurate guide to the sorts of French taxes which you will come into contact with in France, but it is important to point out that it is essentially a layman's guide, not a legal document and that you should always take professional expert advice in French tax matters. Also, be aware that the situation is in a state of flux, especially at the time of writing in 2007 (although updates have been added in October 2010). Nicholas Sarkozy is beginning his new presidency and important changes are expected in this area. 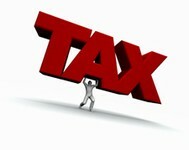 Who is liable for French tax? This is the first question to address, as many people find the French tax issue confusing. In a nutshell, if you are resident in France you are deemed liable for taxation in France. A French resident is someone who has their main home in France and spends most of their time in France, or who spends at least 183 days in France every year, or who has their professional and financial interests mainly centred in France. And if you are resident in France and therefore subject to paying French tax, you are liable to pay tax in France on all your assets, wherever in the world they are. If you are one of the many British people who have financial interests (and frequently homes) in France as well as in the UK, it is important to know that there is a tax treaty between France and Britain which avoids the paying of double taxes. If you pay tax in Britain on your British interests, the French tax office will issue a tax credit for that amount so that you do not have to pay twice. Taxes that will affect most people include TVA (tax on goods bought), taxe foncière (property owner's tax), taxe d'habitation (property occupier's tax), income tax, social taxes (social security and health care funding) and TV licence tax. Car tax is no longer paid annually in France, but there is a charge which you will have to pay when you first register a new car, and this works in lieu of the annual tax. There is also, for those running certain businesses, tax professionelle. Additional taxes you may have to face include wealth tax, inheritance tax and capital gains tax. All the above need to be carefully considered along with the decision to move to France or to purchase property in France. This is similar to the British system of VAT (the letters stand for "Taxe à la Value Ajouté"), and is French tax applied to most goods that you will purchase, to a greater or lesser degree. There is a standard rate of 19.6%, although there are quite a few situations where this amount differs. There is, for example, TVA on food, but the standard rate is considerably reduced for this. This is automatically added to foodstuffs and some goods but remember to ask if it is included when making large purchases as it can make a big difference to the overall price! Those wanting to renovate a French property take note... it may be cheaper to employ a builder to install materials than to purchase the materials and do your DIY. (Building or extending property in France.) This is because if you work on the property yourself, and are not a registered artisan working in a "réel" system of taxation, you will have to pay the higher rate of TVA (19.6%) on all purchases of materials. The same applies if you are employing an artisan who is only registered under the new auto entrepreneur scheme. The two-tiered TVA system means that traditionally registered artisans (who pay TVA) can charge for materials at the lower rate of 7% TVA (used to be 5.5%), and pass on the savings to the client in the form of a lower bill. This means that it can actually be cheaper in the long run to employ an artisan to do the work than to do it yourself. Yet another reason to avoid the cowboys and employ registered professionals! You should also be aware of the different rates of TVA that come into play for old and new properties. Any property which is over two years old is eligible for the 7% rate of TVA on any work done, while works carried out on newer properties must be charged at 19.6%. This is another French council tax, but this time it applies to residents of a property rather than owners. So if you rent a property in France, you will have to pay this tax on the property. If you both own and live in your property you will, of course, be liable for both taxes. The tax is levied on residents of French property from January each year, so if you do not occupy your property until, for example, March, you will not be liable for that year. Remember too, that the TV licence will be added to this bill, and you must pay this even if you only use your TV for a monitor for your computer, or to view videos. If you do not have a TV at all, you must inform the French authorities and request to have this tax removed from your bill. The important thing to remember about French income tax (apart from the fact that you must pay it!) is that if you are a tax resident in France this must be paid on your world wide income, not just that which is earned in France. This declaration is due in May, but it refers to a tax year which runs concurrently with the calendar year, unlike in the British system when the tax year runs from April to April. It is also possible to complete your tax return on-line. A final and very interesting point regarding French income tax is that in France, you are taxed as a family, not as individuals. The calculation takes a husband as one unit, a wife as another, the first two children as half a unit per child and subsequent children as a unit each. The size of the family thus determines the amount of tax as the net income is divided by the number of units in the household. There is a very high standard of health and social care in France, and this needs to be funded through taxation. The standard charge is called CSG (Contribution Sociale Generalisée). There is another charge which was introduced in 1996, to counteract the debt in which the French social system found itself. This is known as the CDRS (Contribution pour le Remboursement de la Dette Sociale) and is levied at a rate of 0.5%. Finally, those with an income from rental property will pay a further charge of around 2%. The dreaded French wealth tax affects anyone ("anyone" in this instance refers to any household rather than individuals, so a couple are charged on the sum of their joint assets) whose assets (anywhere in the world) exceed 790,000 Euros (subject to change, but correct as of October 2010), if they are French residents. Although another law passed recently (October 2010) allows new arrivals in France to not have to count their non-France based assets towards wealth tax for the first five years. If they are not French residents this tax only applies to their French assets. There are some exceptions and allowances to this tax, but if you feel you may fall into this bracket it is important to seek expert advice to minimise your liability legally. The final category of taxes generally payable in France includes inheritance tax and gift tax. Inheritance tax is a very complex issue in France, and it is vital to seek expert advice and make sure that you understand all the implications before settling in France, as it is very different from UK law. The threshold is lower, the rates are higher and there are restrictions on the people to whom an estate can be bequeathed. On top of this, if you are a French resident, all your worldwide assets are liable to French inheritance tax. There are legal measures that you can take to lessen the impact of these taxes and laws. French financial specialists and notaires can usually advise. French taxation is a highly complex issue, but if you are going to own property in France or become a French resident, then it is an issue with which you are bound to become familiar! It is beyond the scope of this article to detail accurately all aspects of the system, and it is in no way intended to take the place of an expert financial adviser. Rather, it is intended to outline briefly the type of taxes which are likely to affect ex-pats who purchase or (in some cases) rent property in France. The situation regarding French tax is also liable to change at any time, and although the writer believes that the information given above is true at the time of writing, this is not guaranteed to be a complete and correct legal document. All readers are advised to take expert advice before implicating themselves in the French tax system. Please advise what is the present level of inheritance tax in France, what is the basic rate of income tax and what allowances are given for a single person in respect of free pay. All rates are 2007 for 2006 income, and are current for inheritance. IHT - Paid by the beneficiary, not the estate. The rate of IHT depends on who is inheriting. Don't forget the social charges of 11% on top of these rates. Would you have a contact e-mail for the French Inland Revenue. Thanks for contacting us. I've tried to find out but seem to be only able to contact the tax office via links from their website (www.impots.gouv.fr), when asking specific questions from the Internet section. I cannot see email addresses for local offices, only addresses and telephone numbers. Perhaps you could ring the one you need to see if they have an email address for you to use? Sorry I cannot be of more help. Can you help? At what level do you start to pay TVA? We have just bought a tourist gift shop in Brittany. Could you PLEASE just let us know if we have to pay French tax on our UK tax-free ISAs. We moved permanently to France last May and are now in the French health system. We fill in our first tax form this May in France and as retirees we'll be sunk if we have to suddenly have to pay tax on our ISAs!! Thanks for any help you can give us. "There is no direct liability in France to interest earned in the UK on an ISA. However the annual amount of interest earned thereon should be entered on the pink supplementary form No 2047-K in section VII. This total should then be entered on line 8 TI on the main (blue) tax return. This total will be aggregated with other income arising in France to determine the level (barême) of tax payable. Normally this will not be enough to alter the eventual liability." I thought I'd let you know that we filled in our tax declaration form and actually felt we had to raise this face-to-face with a tax officer, just for peace of mind. Anyway, she photocopied our ISA information, did her research and contacted us a couple of weeks later to say that we don't have to pay tax on the interest on our ISAs. It's already "degreve". So that's a relief. Hi there - I have read that if you buy a commercial business in France eg: a campsite or old hotel, you have to pay an additional 18.6 % purchase tax on top of all other fees. Is this correct? Hi - I wonder if you have heard of any new taxes on selling a property, even if the property is your main residence. I am just about to sell my house here which is my main residence and have been advised to complete by the 31st of December as from the 1st Jan 2012 all sales will be subject to a 12% tax on any gain. Hi there - I have a question that isn't covered in your article on tax. Is there annual car tax in France? I have two cars both registered in France with a certificate d' immatriculation and both insured. But I don't have car tax or have I paid it when I registered the cars? And if so is this a once off payment? Hope you can help! Thanks for contacting us. Car tax is currently not paid annually in France as it is in the UK. There is a charge/tax which you will have paid when you first registered your cars, and this works in lieu of an annual tax. This would have been a one-off payment, with no further tax due on your cars. I was hoping you would be able to provide some guidance on how the tax system would impact me and my partner. I am considering taking a job in France, and so would be liable for the usual taxation. My partner would continue to work in the UK but would reside in France for four or five days. Would the French taxation system subject him to all of the French taxes, or due to the double taxation agreement, either none or only the habitation tax? I reach UK retirement age of 65 in August 2012. I have lived in France since 2000, paying French tax and URSSAF contributions on my private UK pension, and have not worked (though my wife and I have two properties let as holiday homes). I understand that I should cease paying URSSAF contributions when I retire, but can anyone tell me what procedure I must go through with URSSAF to stop payments? If anyone has more details on this it would be fantastic if you could let us know using the box below. Thanks for your help. We are building a holiday home in the south of France. Does a new build attract zero-rated VAT/TVA? i.e., are we liable to pay the tax on labour/materials invoices? Thanks for contacting us. I understand that new builds under two years old would incur TVA on labour/materials at 19.6%. However I am not a tax expert, so for confirmation of this I would suggest you contact a tax or legal advisor or even builder, perhaps using our Business Directory. Would the building by a TVA registered builder of a wooden verandah and also wooden decking in the front of a house each be eligible for TVA at 7% as opposed to at 19.6%? Thanks for contacting us. I would think they would be eligible to TVA on materials at 7%, if a fully registered builder, as long the property is more than two years old. However, as I am no expert in such matters, I would suggest you contact perhaps a builder from the Business Directory section of our site, for their advice. I have a house in France and have not received my Taxe Fonciere notice. I cannot find any Web address on this site or any other where I can send an enquiry. Thousands of whingers complaining to each other but no reference to official contacts within the French government to sent questions to. Can you address this oversight? Thanks for contacting us. In our article "Taxe Foncière and Taxe d'Habitation - property tax in France", we mention numerous times that if you have any queries about these taxes, you should contact your local council offices (Centre des Impots Fonciers or Bureau de Cadastre) or even your Mairie. I do not own a television neither is one in my home in France - I paid the TV tax last year and asked for it to be reimbursed, I have been charged again this year. I have not been reimbursed for last year. Thanks for contacting us. I am not sure why you are being charged for this. I would persevere with your local property tax offices (Centre des Impots Fonciers or Bureau de Cadastre) to get them to sort it out. Perhaps your Mairie can help? I have just started to let out a property in the French Alps dealling with this in the UK re: payment etc and it's only UK residents who we let it to. I declare this on my tax return so now do I have to declare it in France as well? Thanks for contacting us. I wouldn't think you do, if it is all done through the UK, but as I am no expert in tax matters, I would suggest you contact a tax or legal advisor for expert advice. My wife and I own a small house in the 66 department. We have owned it and enjoyed frequent visits to the area since 2000. Now in retirement we can no longer afford the upkeep and cost of travel. We have had the house on the market for sale for two years but can't find a buyer. So we plan to let the house furnished to a local French family and have agreed a rental of 400 Euros per month, it's likely to be a long let. We are happy to do this and understand the implications of letting. Who do we pay tax on our rental profits to? We are UK tax payers and will of course declare our income to our accountant, so will pay UK tax on the income. We have however read recent reports in the newspaper of a proposal from the French Government that tax must also be paid to them. Is this right? Hope you can shed some light on this. And/or the legal advisors on our site at http://www.frenchpropertylinks.com/frenchlegalservices.htm. Good afternoon, would you please confirm that Taxe Fonciere is payable on a plot of land with planning consent but on which construction has yet to commence? Thanks for contacting us. In answer to your question, I understand that Taxe Fonciere may well have to be paid on land (with or without planning consent), but this is usually at a reduced rate. As rates and rules seem to vary between region and tax authority, I would suggest you contact the local council offices (Centre des Impots Fonciers or Bureau de Cadastre), or indeed the Mairie, who should be able to advise. I have a question about TVA rates on gites and I wonder of you might be able to answer it or point me in the right direction. I have two gites in the Languedoc. The business is set up as an Entreprise Individuelle, regime reel simplifie. I was advised at the outset that I would need to charge / pay 7% TVA on the rental from the gites, but the local tax office have recently said that this should actually be 19.6% (20% ongoing). Could you advise? Many thanks. I am slightly confused by your questions. TVA is currently charged at 20%, this was 19.6%. But it is income tax that is charged on rental income from gites (once your deductible costs are deducted from your gross rental income). The rate of income tax will depend on your total income (not just from gite rental) for the previous year, once allowances have been taken into consideration. This can often be complex, and as I am no expert in these matters, I would suggest you contact a tax advisor for clarification. I'm sorry not to be able to help further. We are building a new property. We are going back this July for four months to continue the build. We would like to live on site - is this possible? Also will we charged either Taxe d 'Habitation or Taxe Fonciere? Thanks for contacting us. I cannot see why you would not be able to live on site, but I think you would need to check with your Mairie about this. And I am not sure if you have read our article " Taxe Foncière and Taxe d'Habitation - property tax in France", but here we say that some new builds may be exempt from property taxes in France for the first couple of years, but you need to make an application to the authorities. However, these reductions are given only if you have submitted a tax return in France, declaring your income. They are given automatically by the local tax authorities when you submit your tax return, so as you are only visiting for four months this may not be possible. It's always worth checking though, especially if services have still to be connected, or if it is uninhabitable, so I would suggest you contact your local council offices (Centre des Impots Fonciers or Bureau de Cadastre) for their advice. I was wondering if you live in France and are making home goods (such as cards/postcards) do you have to declare all earnings from your sellings if you sell on like a place like test? Or is there a certain amount that you can be under and not have to declare your earnings? Having started up business and need to know since don't expect to make much. Thanks for contacting us. I have a feeling you may have to declare all income, even though tax may not be due, but as I am no tax expert I would suggest you contact a tax advisor for accurate information on this. He/she could also advise on when tax would need to be paid, as amount you can earn without paying tax very much depends on your circumstances. I am confused if I should paying prelevements sociaux for this tax year on income from my UK rented property. I have lived in France for seven years now and it still seems to be a mystery if I should be paying it. Thanks for contacting us. I am afraid I can only suggest you contact a tax advisor on this, as I am no tax expert. Perhaps you could try BDO Limited. They provided much of the information in our tax articles. Contact details are as in our answer to the previous question. You could also try the legal services mentioned there. I am non-French I would like to buy a holiday house in France. What is the tax I will pay yearly, and are there any other taxes to pay and to pay every year? Also can I get resident visa for long time? Thank you and waiting for your reply. Thanks for contacting us. I am unsure as to what nationality you are, but for UK citizens/residents, the main yearly taxes they will need to pay on holiday homes are the French property taxes, see our article "Taxe Foncière and Taxe d'Habitation - property tax in France". Though as I am no expert in these matters, I would suggest contacting a tax/legal advisor for expert advice. Regarding visas, UK citizens do not require a visa for France if they hold a valid UK passport, but for visa regulations for other nationalities I would suggest you contact the French embassy. Hello -I was wondering if you could provide some information on the following matter. I am a permanent resident in France, working full-time and I will be offered a small part-time job during weekends in the UK. Will I be taxed twice on the UK income in France? Thanks for contacting us. We have many articles about tax in France on our site, which I am not sure if you've seen, but essentially if you are a French resident, you will be paying tax according to French laws, so you will have to pay tax on income earned anywhere in the world. So I would think you pay tax in France and not in the UK. Wherever the tax is paid, however, the tax treaty which exists between France and the UK ensures you would not need to pay twice. But as I am no expert in tax matters, I would suggest you contact a tax/legal advisor, for their advice. Perhaps contact BDO Limited. They provided much of the information in our tax articles. Their details can be found above, as can the details of other legal services. Hello - previously I filed French Non-furnished and Micro income tax returns (via an agent) as I rented my property. Now my Mum occupies the house on a free of charge basis. I assume I will not have to pay tax as I receive no revenue? Is there an agency I should notify of this change? I pay Taxe Fonciere and Taxe d'Habitation. I currently live in Switzerland. Many thanks in advance. Regarding who you have to notify, I would say the tax office to which you paid your income tax prior to this would need to be told, but again, I would check with the relevant experts. We moved to France in October 2017. Main home. No other property. Do we submit our first tax return in May 2018 for the 3 months as residents? We are also not married, so understand that we submit separate tax returns, with our UK investment and pension included included. Will we both get a tax allowance before the tax is deducted? Thanks.